The Document Control module from Grand Avenue Software manages the change and deviation processes for controlled documents. Important aspects of the Document Control process include submission, assessment of business impacts due to the change, review and approval, and implementation/rollout of the approved changes. The Grand Avenue Software Document Control module automates and manages all these activities and tasks. The screen capture of the Document Control application shows a new change request as it is moving through the change management process. This particular change is to a product called the Super Mover 2004, a wheel chair. 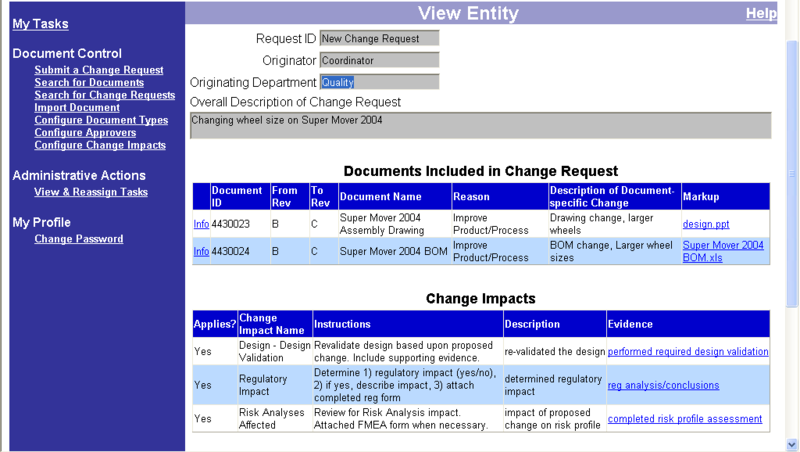 The change shown in the screen capture includes two documents (drawing and bill of materials). Additionally, three change impacts have been identified (design validation, regulatory and risk analysis) and have been investigated for this particular change. These appear in the Change Impacts section of the electronic change order form.